This didn't quite turn out how I expected, but I suppose it was a decent-tasting and interesting dish...but something that's only good served the day it's made. For some reason, I got the flavors of tuna noodle casserole upon first bite. 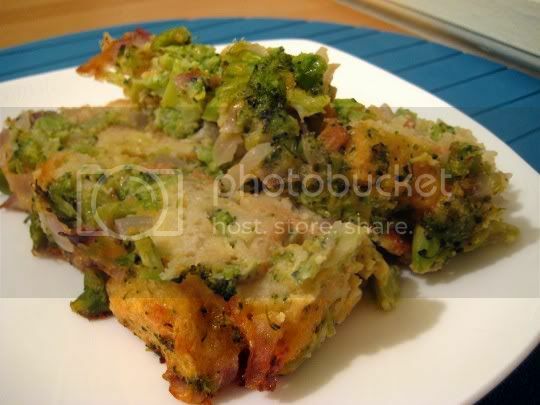 It's probably the mass of chopped broccoli and cheddar in the recipe (hence, broccoli-cheddar loaf), or maybe it was the sort of "wet" texture, thanks to the added eggs and water. And herein lies the problem...too much liquid! This should have been a dense, bread pudding-like loaf, and not something that fell apart upon slicing. Half a loaf of day-old French bread cubes couldn't even soak up enough of the liquid. This loaf was also baked in a water bath (the pan was placed in a larger pan filled with water) which is supposed to provide steam during baking to prevent custards, etc. from becoming too rubbery or drying out. But I think this is exactly what this loaf needed...to dry out. I would have loved to give this recipe a higher rating, but the texture just totally killed it. Make again? Probably not. This would need to much further recipe experimentation to get to what it needs to be.